“Somatic Symptom Disorder: An Evidence-Based, Multidisciplinary, Inpatient Rehab Approach” was presented by Janey McGeary Farber, PT, DPT, PCS, ATP, on April 17th, 2018. Janey Farber is a physical therapist and Supervisor of Inpatient Therapies at Gillette Children’s Specialty Hospital in Saint Paul, Minnesota. In this role, she has both clinical care and supervisory responsibilities, including the development and implementation of various clinical practice guidelines such as for treatment of children with Somatic Symptom Disorder (SSD). She holds special certifications as a Brain Injury Specialist, Pediatric Certified Specialist, and as an Assistive Technology Practitioner. Janey received her undergraduate degree from Fordham University – College at Lincoln Center, her Master Degree in Physical Therapy from The Washington University School of Medicine, and her post professional Doctorate of Physical Therapy from Drexel University in Philadelphia. She is currently part time faculty at the University of Minnesota where she lectures and assists with lab coursework. As a long time active member of the APTA (American Physical Therapy Association), Janey has worked on several special projects such as question writing for certification exams and increasing public awareness for Pediatrics. When not in the clinic, she enjoys renovating her historic home, doing the Sunday crossword, and spending time with her husband and girls. Recognize the interdisciplinary components of an effective treatment plan for individuals with SSD (pain subtype) or Functional Neurologic Disorder (Conversion Disorder). 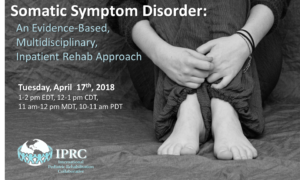 Please follow the link to view the live recording of Somatic Symptom Disorder: An Evidence-Based, Multidisciplinary, Inpatient Rehab Approach or copy the link below into your browser.